In his cookbook Mexican Everyday, Rick Bayless describes this breakfast which he cooked for his wife during the first year of their marriage, then forgot about until 25 years later. I make it fairly often because, well, who doesn’t love breakfast potatoes and avocado? Make sure to leave the yolks very runny. 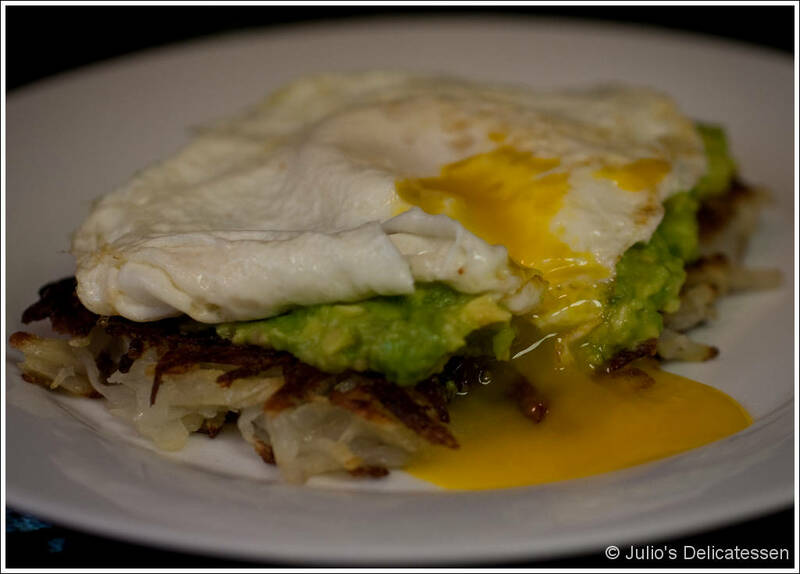 Even if this isn’t your normal preference, the yolk works well with the avocado and potatoes. Peel the potatoes. 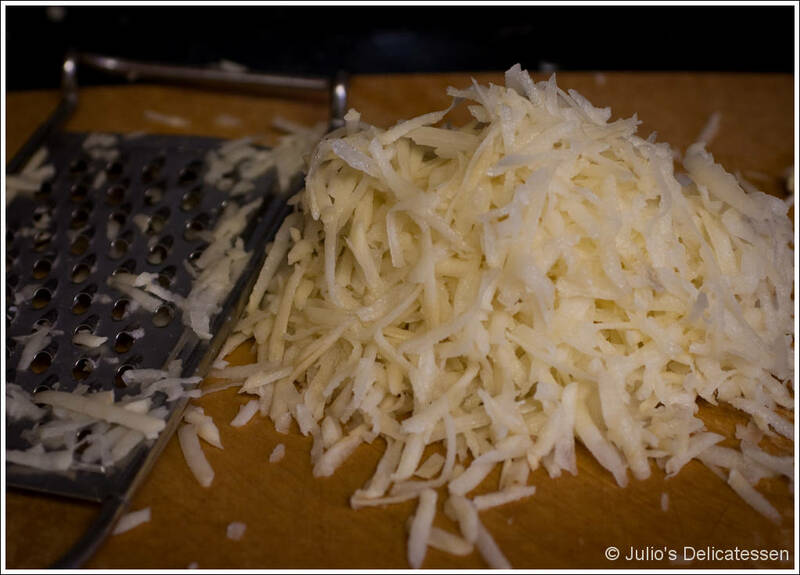 Using a box grater, shred them both. Using your hands, scoop up a handful of potatoes and squeeze out as much liquid as possible. (Doing that over the sink is recommended.) Heat some olive oil a large cast-iron skillet. 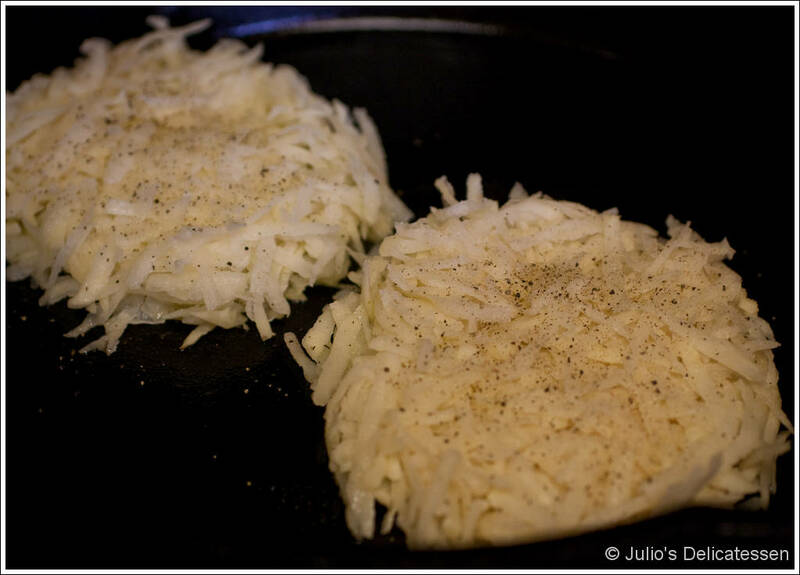 Place two large handfuls of potato in the oil and form them into two round potato cakes. Salt and pepper each one. Cook for about 7 minutes (or until the first side is well browned) then flip and cook the second side until brown. Meanwhile, mash the avocado with some salt in a bowl. In a second (non-stick) pan, fry two eggs over easy. Place a potato cake on a plate, smear half of the avocado on top, and place a fried egg on top of that.